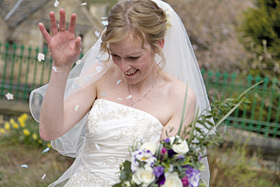 Leeds / Bradford Wedding Photographer covering weddings in Wakefield, Dewsbury, Leeds, Bradford, Halifax and surrounding areas. Modern and Traditional Wedding Photography for the most exciting day of your life! Weddings are now being photographed in a more relaxed contemporary reportage style which captures the true emotion and realism of the day. However Traditional and elegant poses are still valued and as an experienced photographer I find a combination of traditional and reportage styles can work very well. I will photograph your wedding day with a combination of natural and posed portraits of the Bride and Groom. As well as family groups, bridesmaids, best man, guests, preparations, wedding cars, flowers and the cake. From morning to evening I offer both full or partial coverage of your special day. For your photographs I can offer a choice of good quality wedding albums from a range of suppliers, providing you with a lasting memory of your special day. I also offer a full range of framed prints, canvases and other media. Based in Yorkshire near the border of Bradford, Shipley and Leeds I offer a fully insured, affordable and professional local service as well as national coverage by arrangement. 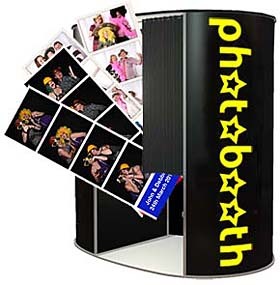 Hire a fun photobooth for your wedding reception. Your guests will have hours of fun posing and will each recieve a lasting photo momento of your wedding. You will recieve a FREE guestbook containing a copy of each photo and full of great messages left by your guests. Our fun photo booths provide unlimited prints, video messages, custom photo strips and come complete with a prop box full of wigs, moustaches, hats, fancy dress and a range of fun props.